Daniel "Danny" Parsons - Raymond "Rag"
Adedamola "Damola" Adelaja - Tagbo "Tag"
Two childhood friends are reunited after many years and discover their feelings for one another have taken a new turn in this drama, the first feature film from writer and director Adaora Nwandu. Raymond (Danny Parsons), known to his friends as Rag, was born in England to parents who were expatriates from the West Indies, and as a child his best mate was Tagbo (Damola Adelaja), or Tag for short, whose folks were émigrés from Nigeria. Rag has left behind a girlfriend and child in the North of England to move to London, where he's ended up on the wrong side of law, while Tag has graduated with honors from law school and is looking for work while dating Olivia (Tasmin Clarke), a white political activist. By chance, Rag and Tag meet again one day, and despite their differences they soon become fast friends again. 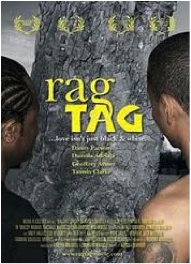 Rag and Tag seem to understand one another on a level others do not, and when Tag brings Rag along for a business trip to Nigeria, their friendship moves to the next level and they become lovers.